NYF raised the bar for the 2014 competition, unveiling the Agency of the Year by Region Award. This newly launched award recognises the highest awarded agency by the following regions: North America, Latin America, Europe, Middle East & Africa, and Asia Pacific. New York Festivals recognises exceptional contributions by individuals and companies within the international advertising community. In addition to Agency of the Year by Region, special awards in the competition include: Global Agency of the Year; Best Boutique Agency of the Year; Best New Agency of the Year; and The World's Best Idea. To view a complete list of all special awards visit here. NYF's International Advertising Awards is recognised worldwide as a touchstone for global creative excellence in advertising and marketing communications. 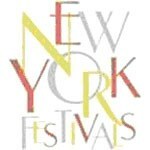 Since 1957, NYF has received entries from 75 countries in all media in the following competitions: Avant-Garde, Branded Entertainment, Collateral & Direct, Creative Effectiveness, Design, Digital, Film & Film Craft, Integrated, Outdoor, Print, Public Relations, Public Service, Radio, and Student. "NYF's widely praised jury selection process and its revolutionary matrix judging system draws participation from the world's foremost creative agencies. Entrants to the competition have the opportunity to have their work seen by 400+ members of the NYF's Executive and Grand Juries, an incredible brain trust of global creative minds, who collectively cast over 300,000 votes to select the World's Best Advertising," said Michael O'Rourke, President, International Awards Group and New York Festivals. This is the fourth year that New York Festivals will assemble an elite group of Global Chief Creative Officers from the world's most prominent ad agencies to participate on the live Executive Jury. These high-level creative officers will meet 25-29 April to judge the final rounds to select the World's Best Advertising. The 30+ Executive Jury evaluates every shortlisted entry selected by the online Grand Jury. With over 400 jury members representing more than 75 countries, NYF has the largest and most diverse international jury in the world. This process, along with the patented matrix judging system, insures that each entry earning an award truly earns the World's Best Advertising bragging rights. The 2014 New York Show will take place on 1 May 1 and will feature creative panel discussions, keynote speakers, networking events, the awards ceremony, and after-party to honour the winners in true New York style. All New York Show events and the 2014 awards gala will take place at the New York Public Library's Beaux-Arts landmark Stephen A. Schwarzman building located at 455 Fifth Avenue in New York City. Entries submitted before 16 December 2013: SAVE 10% and use the code PRN2014. The 2014 competition Entry Deadline is January 31st, and all entries submitted after 31 January 2014 will be subject to a 15% Rush Fee. For more information on the 2014 competitions go to: Rules & Regulations or to enter go to Log In.